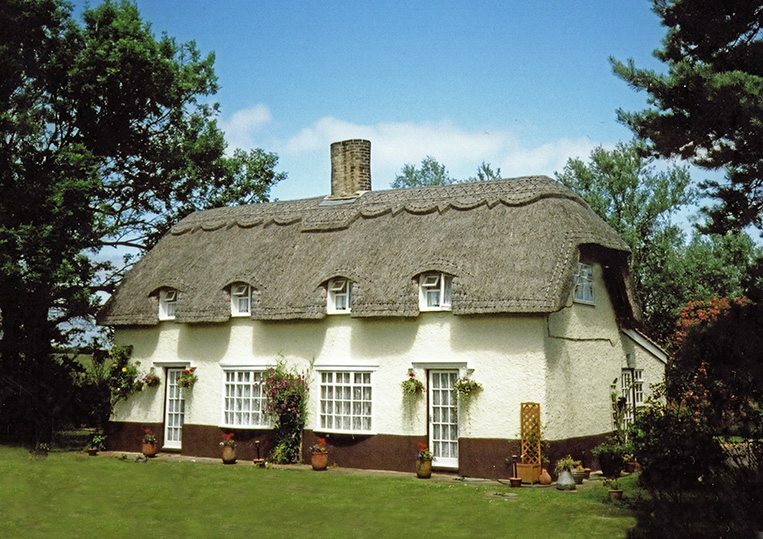 Norfolk has less than half the number of thatches, than counties such as Dorset or Wiltshire. Along with most east coast districts, imported, and later locally produced pantiles, have long been in use here. 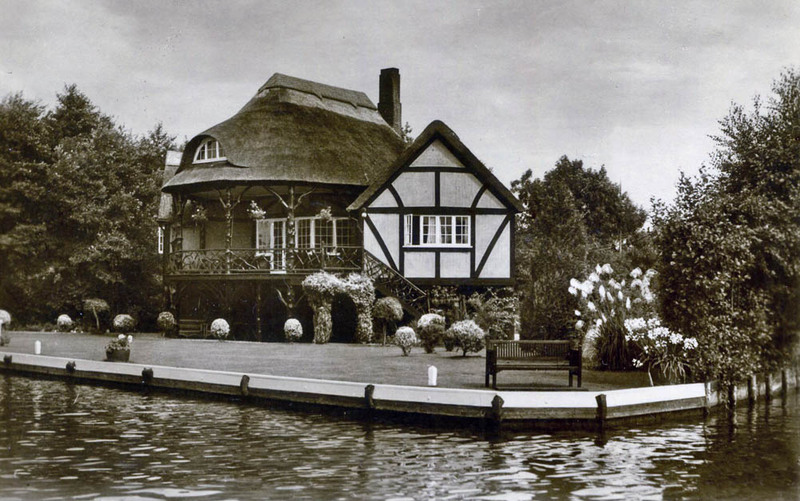 Replacing most thatch over the last two or three centuries. This county is also the home many productive beds of water reed, which here must be called Norfolk reed. Yet away from these marshy areas, there seems to be as much long straw thatching, as any other type. 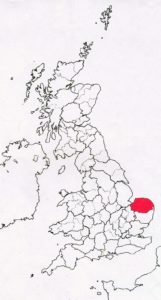 Until recently Norfolk reed was confined to the Broadland districts, due to the cost of transport. Sixty years ago only half the county’s thatchers could use it. 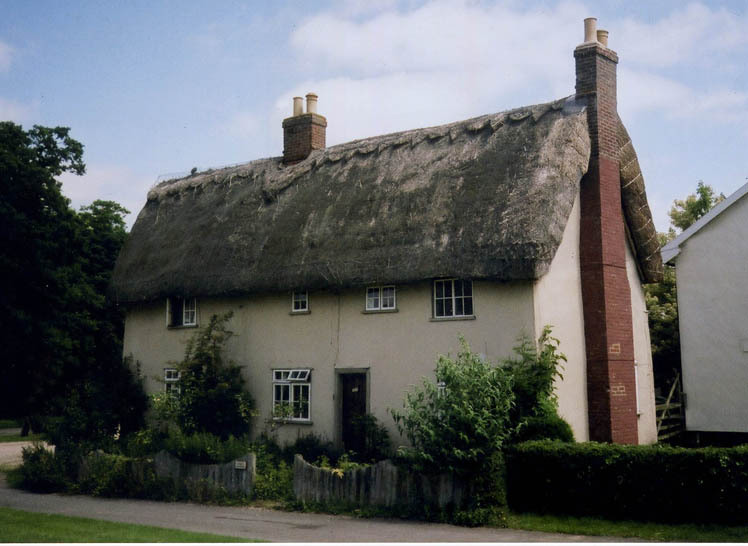 Royal thatch…If this county lacks quantity, it does not lack quality. Thatchers here have long created much stunning work, in the county’s own reed. Often leading to employment far from home. But this old image is much closer. Being part of the royal Sandringham estate. 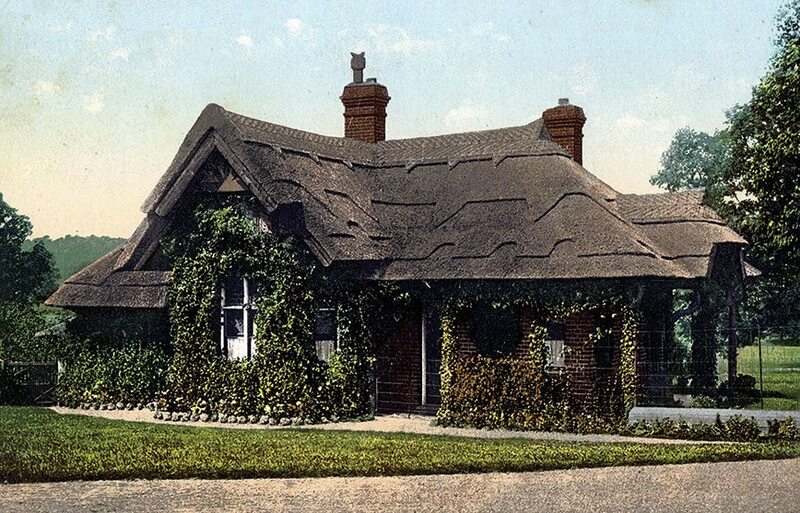 Both the thatch, and building shown here, date from the late nineteenth century. 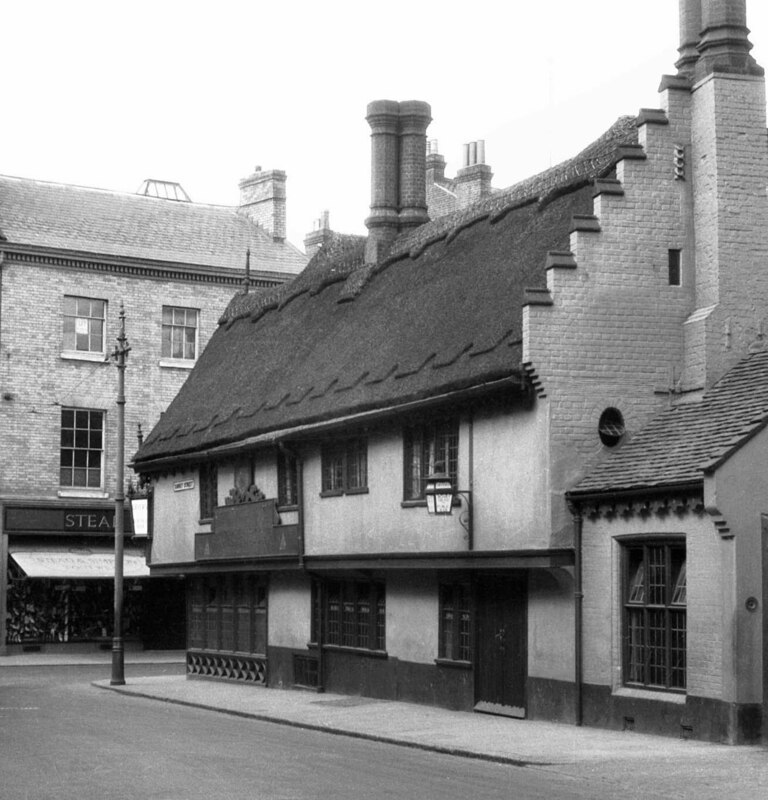 City centre pubs… In Norwich. A city, still with a thatched church and bank. The large ‘Boar’s Head’, above, fell foul of enemy bombs in 1942. 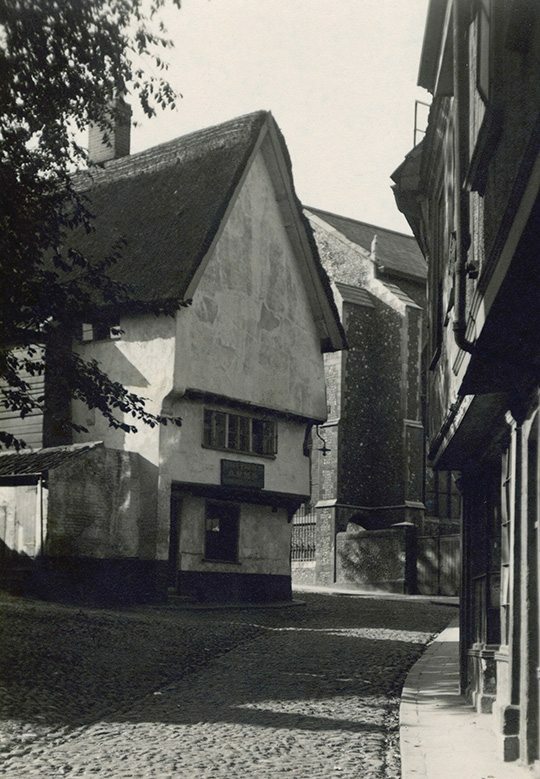 But the ‘Briton’s Arms‘ on Elm Hill, is still going strong. Surviving the Blitz and an earlier fire, in 1507. When both these hostelries were already a century old. 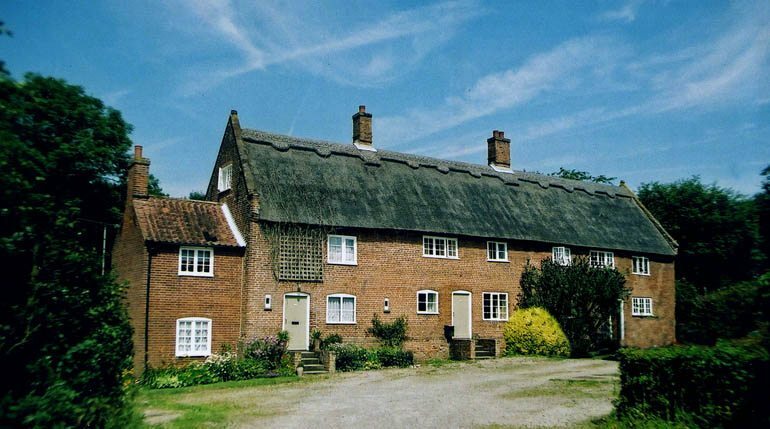 Long and large… The thatch roofs, above, at Wheeting are said to be the longest row of thatching in East Anglia, consisting of 10 Norfolk reed thatches… Below is the well known Happisburgh Manor, which lays claim to be the largest thatch in Britain. Built in the ‘Arts & Craft’ style, with local materials. Only the glass is said to have originated outside the county… Copyright & thanks to Stuart Logan, used under Creative Commons. 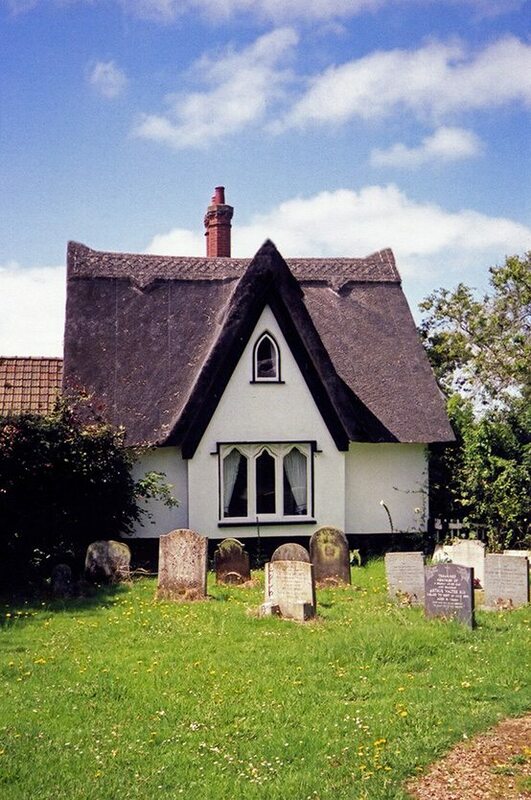 Ecclesiastical thatch… The left photo, is of the old church school house at Woodrising. 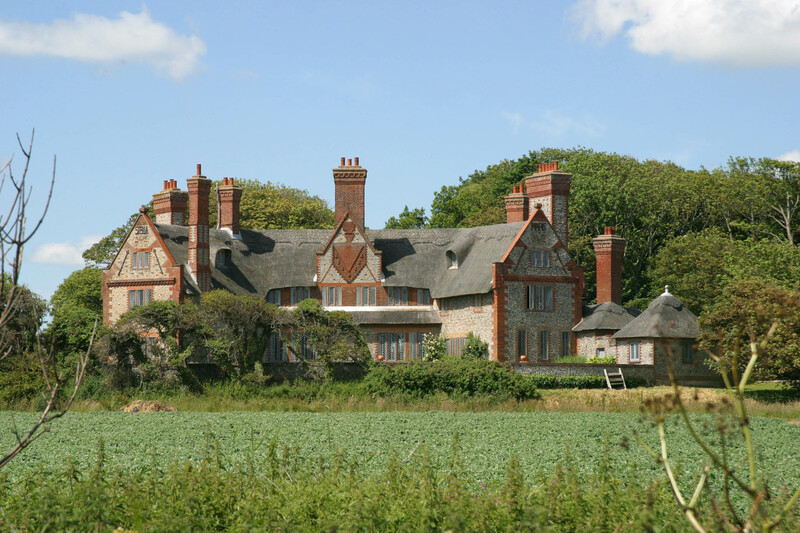 This Victorian building shows the steep angle and ridge details, of the Eastern style well. 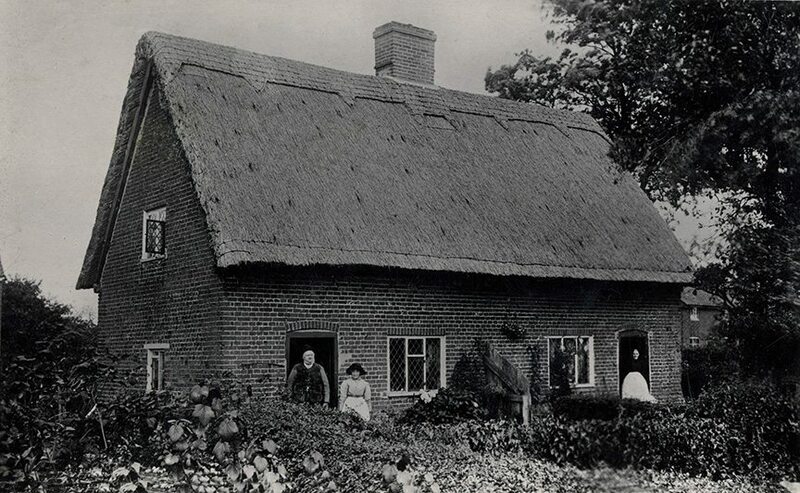 The right image, from the 1920’s, depicts a much older dwelling; the old rectory at Dereham, built in 1502. 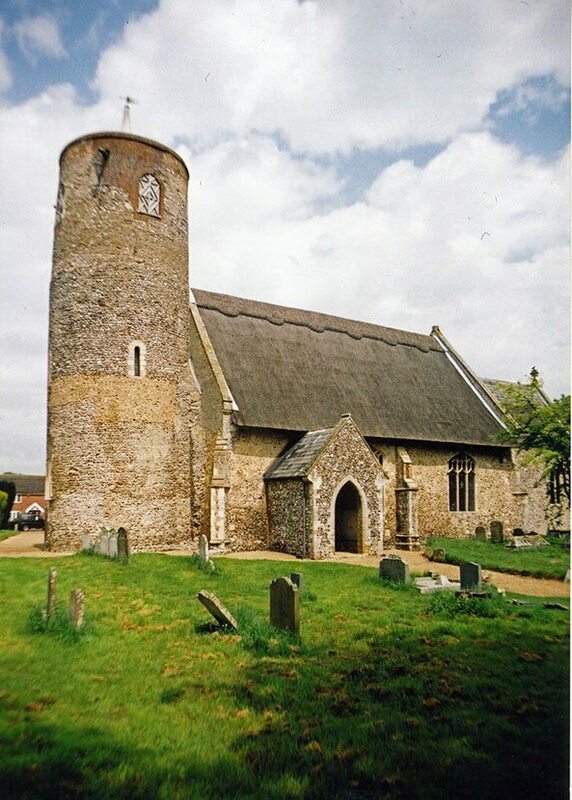 Here dwelt one Edmund Bonner, when vicar of the neighbouring church, in the 1530’s. He rose to be Bishop of London. And allegedly took an active role, in burning a couple of hundred ‘heretics‘, in the religious terror of the1550’s. Ironically his old cottage survived the seemingly inevitable fires, that swept through this town, in the centuries after his time here. 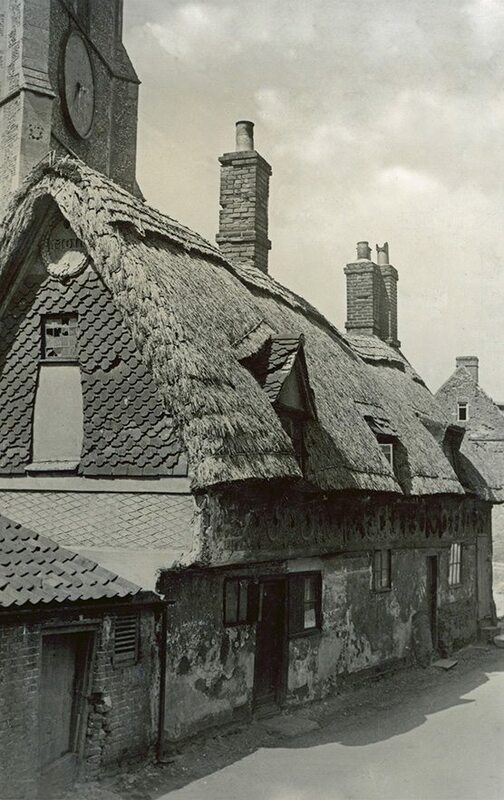 The old image shows a long straw roof with rolled gables. Today the thatch is of Norfolk reed, keeping an attractive museum dry. 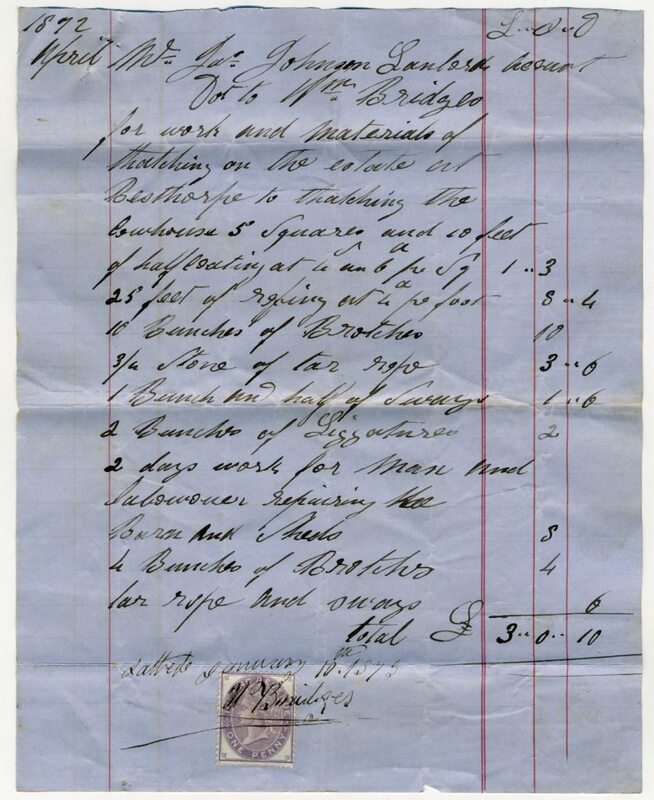 April 1872… This thatcher’s bill seems to relate to work at Besthorpe, near Attleborough. It shows the nomenclature of the local craft; as well as the prices in mid Victorian Norfolk. The main job on the ‘cowhouse’ involved tying on the thatch with ‘tar rope’, and sways. The ridge being completed with broaches (thatching spars) and ‘liggatures’… The thatcher waiting eight months for payment! 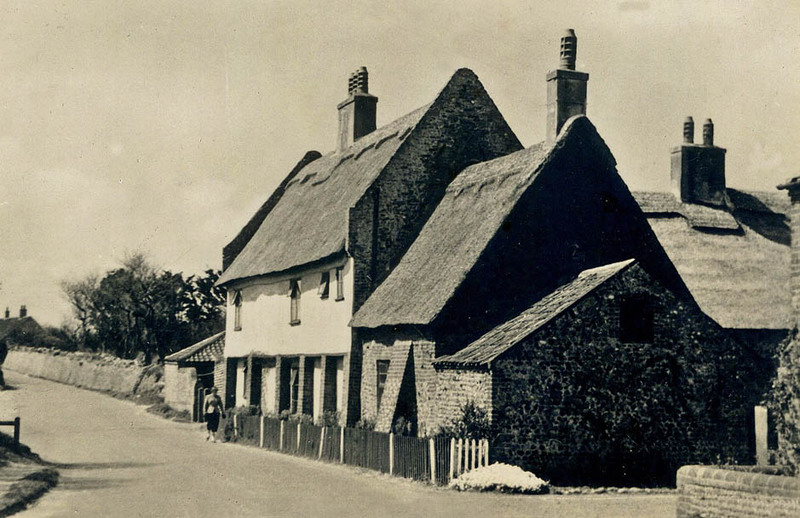 Old long straw thatch… At Erpingham. With the Edwardian tenants, in full view. The wearing long straw coatwork has rolled gables. Topped with a ornamental block ridge. As does the modern roof at Caston, on the right. New long straw thatch… Over in the west of the county, much long straw still remains. 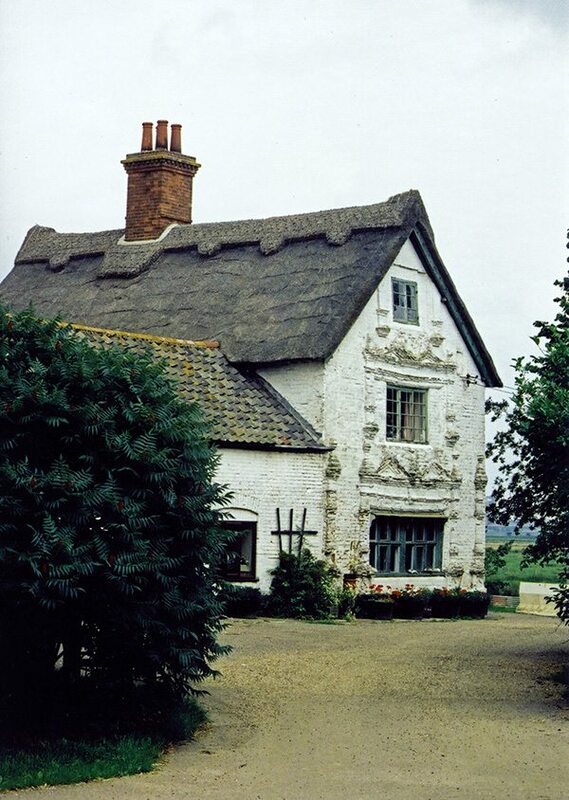 The unassuming cottage, above, has a thatch very similar to the old image of Erpingham. But over time much else has changed here. As this was once the village manor house, dating from the fifteenth century. 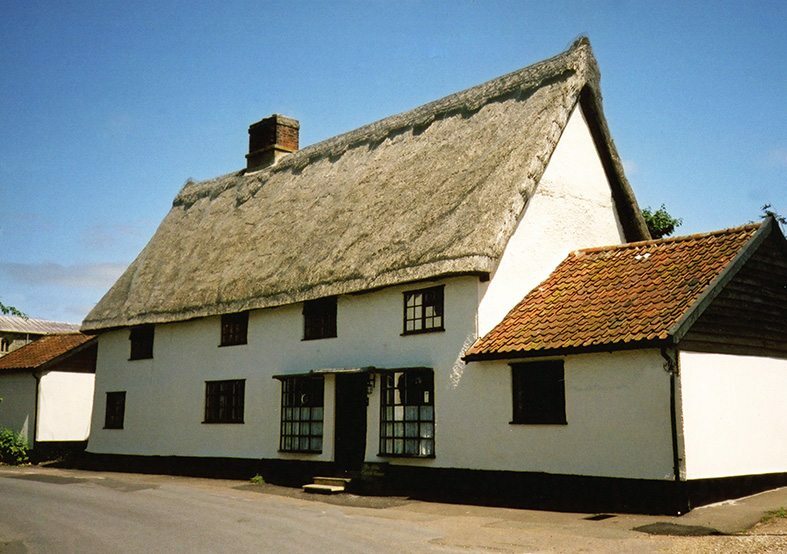 The lower thatch shows a roof with turned gables, in a quiet spot at Salham Toney. As well as water reed, this county had a thriving brick industry, producing ‘norfolk reds’… These form many a masonry gable hereabouts, as at Silvergate, part of the Blicking estate. The roof thatched in the county’s reed. 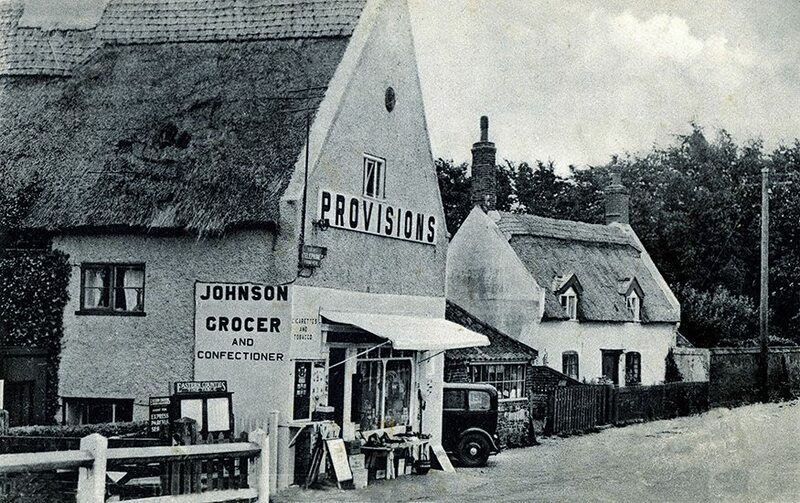 The older images below show, some seaside thatch at Bacton on Sea and a shop at St Olaves. Both from around 1930. The base of the tower, is perhaps over a thousand years old..